About four years ago, Brookline resident Simone Bloom Nathan went searching for a Chanukah book to share with her then three-year-old granddaughter. 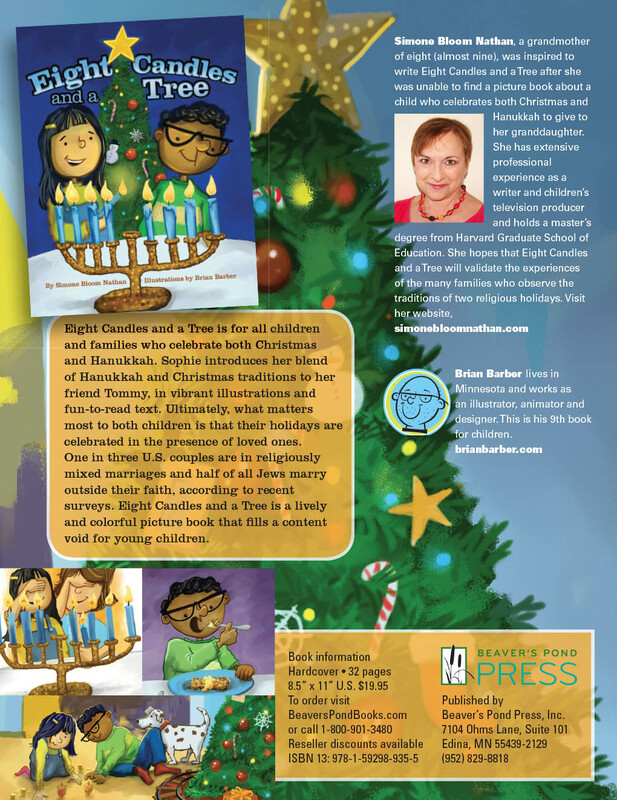 She was looking for a book about a family that celebrates both Chanukah and Christmas, reflecting the ever-growing number of interfaith families that choose to follow the traditions of both parents. Both of Bloom Nathan’s children are married to spouses who are not Jewish. To her surprise, she couldn’t find one. So, Bloom Nathan, a children’s television producer took up her own pen. In the lively read aloud story, animated by Brian Barber’s full-page, colorful illustrations, a spunky girl named Sophie and her curious neighbor Tommy, share their families’ holiday traditions. “The whole point for me is that there is no one way to celebrate Chanukah and there’s no one way to celebrate Christmas. Every family has their own traditions,” said Bloom Nathan. The greatest joy for Bloom Nathan, now the grandmother of nine, was when she presented the book to her oldest granddaughter, who read it aloud to her grandmother. “Did you write this for me?” she asked. “I totally cried. That was worth everything,” she said. More Americans are marrying outside their faith than ever before. A 2013 Pew Research study reflects an overall Jewish intermarriage rate of 58% up from just 20 percent prior to 1960. Among non-Orthodox Jews, the intermarriage rate today is 71%. These figures reveal a changing attitude towards and a broader acceptance of interfaith marriages in America today. Eight Candles and A Tree reflects these changes by showing how an interfaith family celebrates holidays. In this timely and engaging book, Sophie introduces her blend of Hanukkah and Christmas traditions to her friend Tommy through vibrant illustrations and fun-to-read-aloud text. Tommy tastes potato latkes for the first time, savoring every crunchy sweet salty bite. He watches Sophie and her mother cover their eyes and recite a Hebrew prayer as they light the candles of the menorah. Tommy and Sophie play with dreidels on the floor next to her dazzling Christmas tree, as Tommy comes to understand the components of Sophie’s Hanukkah celebration. The two friends share with each other the different ways in which each of their families celebrate Christmas. Tommy’s Grandpa reads “‘Twas the night before Christmas,” Sophie’s dad runs his train around the tree, one family eats a big roast, and the other “stacks and stacks of pancakes.” Subtle emphasis is given to the fact that every family has cherished and different traditions to mark their observance of religious holidays. Ultimately, what matters most to both children is that their holidays are celebrated in the presence of their loved ones. Ms. Bloom Nathan was born and raised Jewish in Johannesburg, South Africa, and she raised her two children Jewish in the Boston area. Both of her children and one stepson have married non-Jews, and Ms. Bloom Nathan has embraced the dual religions of her grandchildren. She has professional experience as a writer and children’s television producer and holds a master’s degree from Harvard Graduate School of Education. 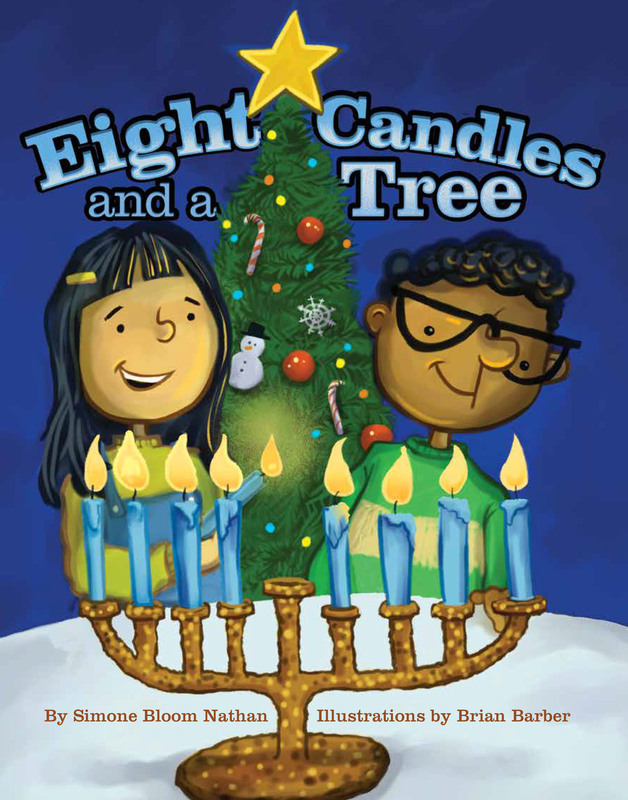 She wants Eight Candles and a Tree to be a book for all families that celebrate multiple holidays.